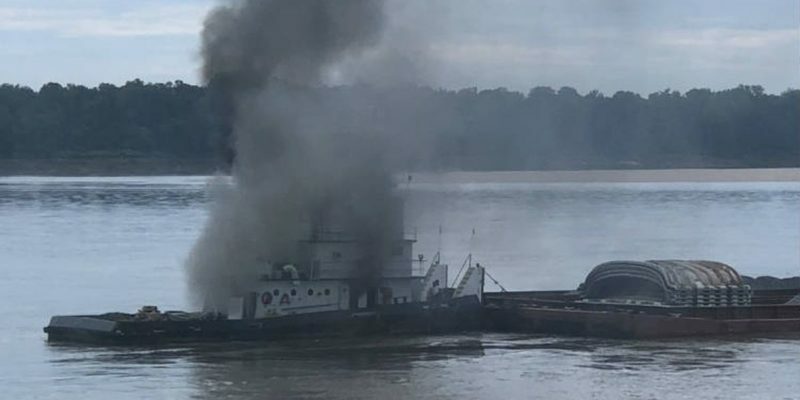 On September 12, the 30 meter long, 218 gt towboat Jacob Kyle Rusthoven caught fire on the Mississippi River at mile marker 664 near Helena-West Helena, Arkansas. 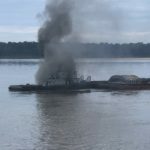 The towboat was pushing 9 barges loaded with rocks when the fire broke out in the vessel’s engine room. The crew was unable to contain the blaze and sent out a distress call. A nearby vessel came to their and evacuated the crew. 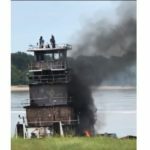 The Jacob Kyle Rusthoven was then pushed to the Arkansas shoreline where local fire fighters were able to extinguish the blaze 7 hours later. No reports of injuries. 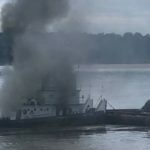 The Coast Guard had stopped nearby traffic on the Mississippi River during the incident. Reports state the Jacob Kyle Rusthoven had some 13,300 gallons of diesel fuel on board at the time, but no pollution was detected. Authorities stated that 3 of the rock barges had broken free during the incident, but were later recovered.